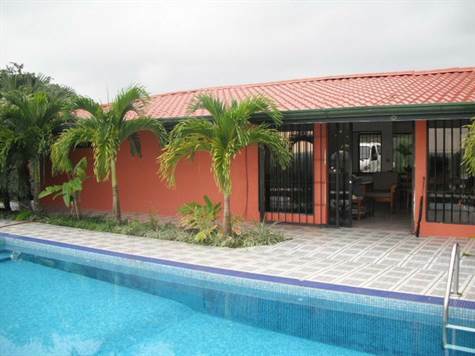 This home is located about 15 minutes outside of Quepos with a view of Quepos point with huge mountain and ocean views. Located on a small hill top with a pond nearby. This home has 3 bedrooms and 3.5 baths with an amazing pool and party area. It has large bathrooms in every bedroom and the master is on one end of the home for privacy from family and guests. The home is on 5200 meters or just over 2.5 acres. Close to local streams and rivers and a short drive to the jungle, mountains or pristine beaches of Manuel Antonio. Very private but close to the action.